Jam-packed with flavor and nutrients, these baked sweet potatoes are filling, nutritious, and delicious. An indulgence you won't need to feel guilty about! You can treat these like traditional baked potatoes and use your favorite toppings, like sour cream, on them, but you can also try some new flavors, such as sliced jalapeno pepper, sliced radish, hot sauce, or diced avocado. Per Serving: 291 calories; 10g fat; 39.0g carbohydrates; 13g protein; 28mg cholesterol; 247mg sodium. 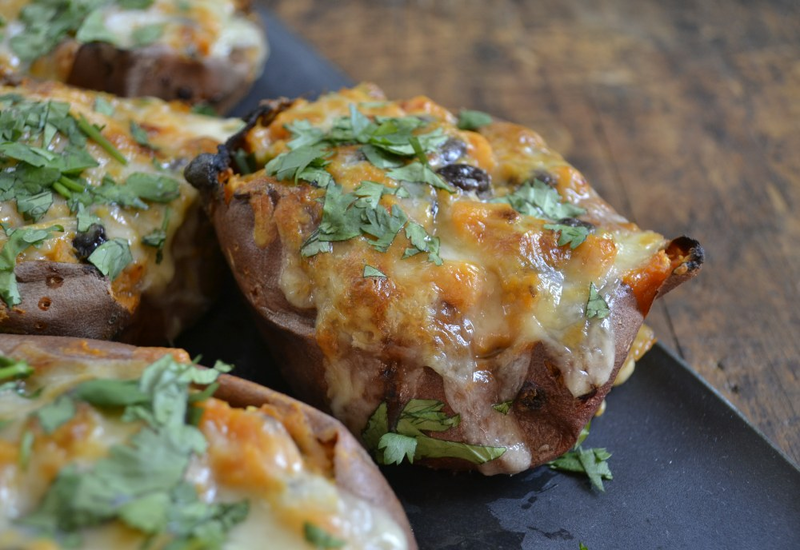 I really loved these twice baked sweet potatoes! I definitely did not feel guilty about adding a cup of shredded cheddar cheese! It was so delicious, and filling. The black beans and jalapeño gave it great flavor, this is definitely my easy weekday go to recipe. Loved this Mexican-inspired sweet potato! I don't usually stray from my sweet potato stuffed with chickpeas, but this really good. Also a great way to use some left over ingredients when you're short on time.